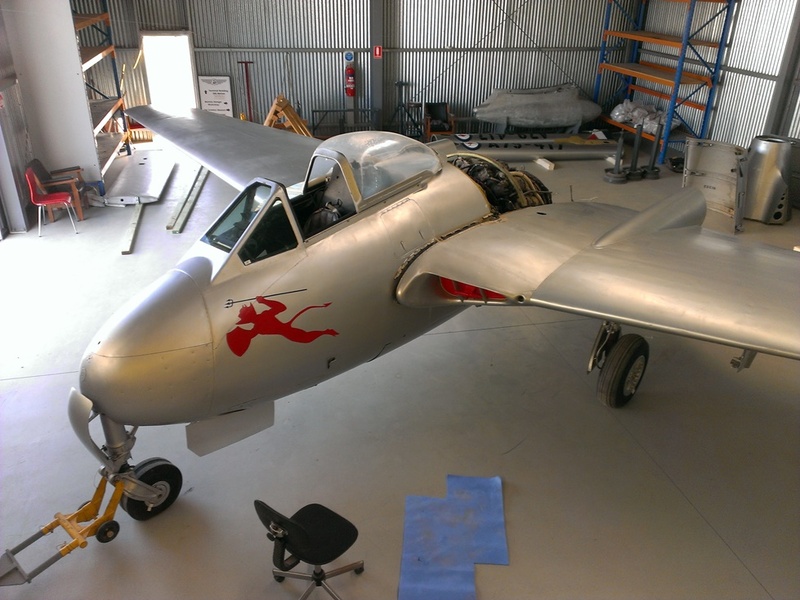 On Wednesday 24th May, Vampire R1382 arrived to join Australian-built Vampires A79-175 and A79-733. Thanks to Gina and the guys at Steve Holland Transport and Turner and Central Cranes. 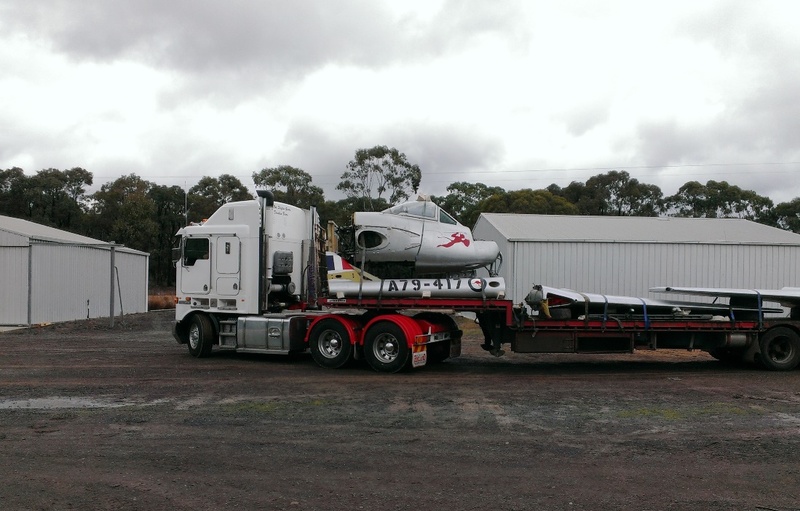 We loaded R1382 on to a semi on Friday morning, 19th May. 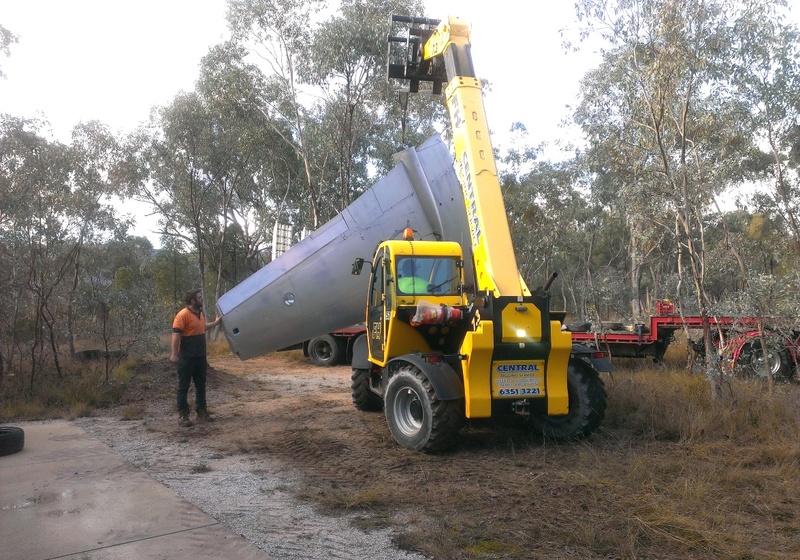 The truck and load went back to the depot; no travel to NSW this week. 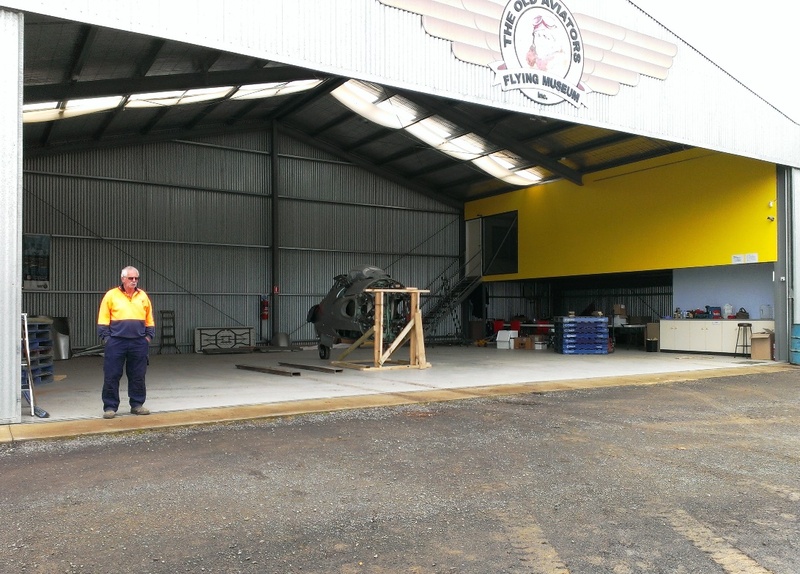 Thanks again to Alwin, Catherine, Gina, Rod and the CVT guys, Brian from the Central Goldfields Shire Council, and the guys from Steve Holland Transport. 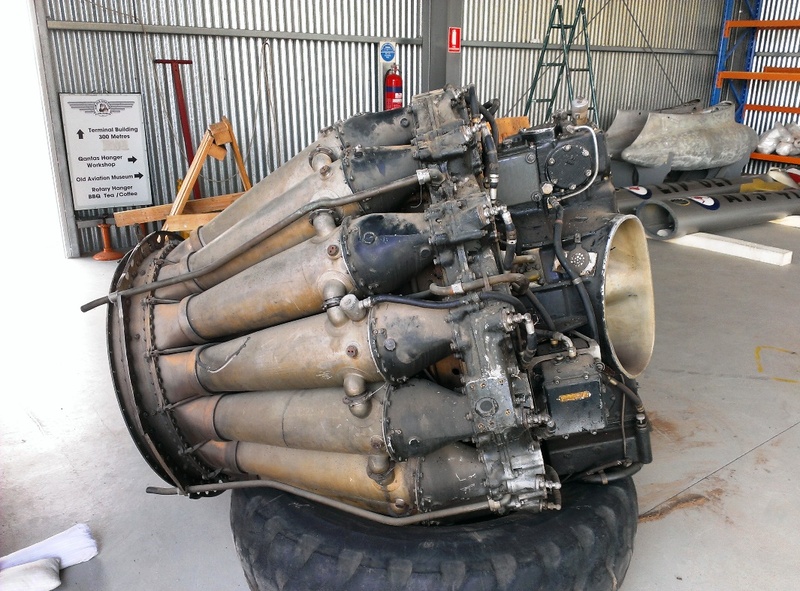 Wednesday: With the headache of trying to get the main gear up and over-centre, I forgot to take any photos! Below is a photo showing that day’s efforts, taken Thurs morning. One of the things that stopped us getting the gear over-centre was the door lock Teleflex, which was seized. Once that was freed, we still couldn’t get her the rest of the way (working on port gear first). Alwin then made an observation about the tyre and suggested we deflate it. That did the trick! The point being that the tyre normally is jammed against a rub strip attached to the cut-away rib that arches over the wheel-well. This is normally done by a ram and with a fair bit of inertia. I was lying on my back pushing the wheel up with my legs – slow and only human! After letting the tyre down, it was 5pm and we had one leg up so that was it for the day. Another good day of progress, thanks to Gina, Alwin, Stephen, Catherine, Rob and Rod Brown and the guys at CVT. … thanks to Alwin, Stephen, Catherine, and Rob from Transaero. An extended record of the aircraft ‘as is’. 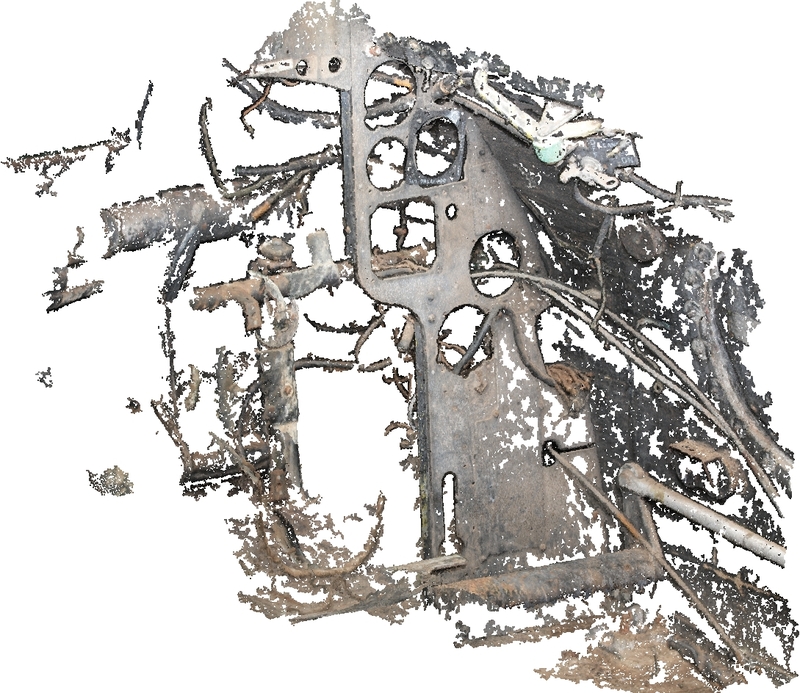 This area of the fuselage is basically quite empty. A large number of photos can provide a record on their own, but this always presents the problem of having to layout the photos to identify the relative positioning. 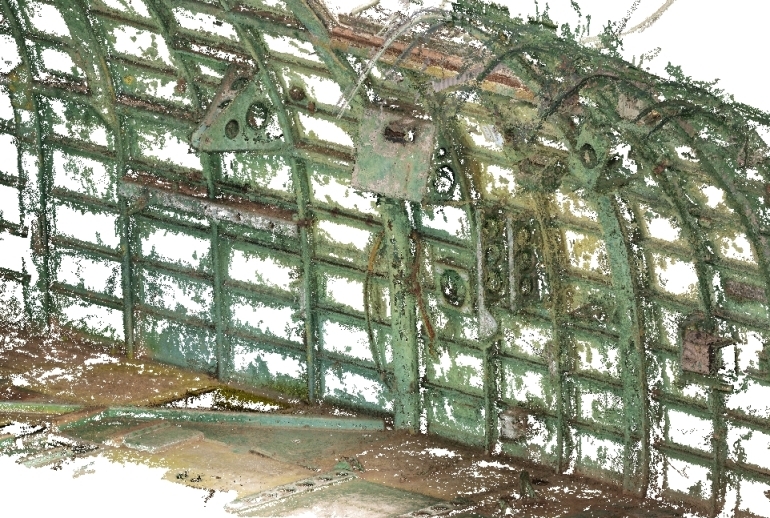 VSFM provides the context for all of the images, and the 3D point cloud provides a continuous representation of the aircraft structure. A means of communicating specifics with others working on Beaufighters. A way of doing this may be to work with a 3D pdf file. This would include any annotations applied to the 3D that identify part-numbers, descriptions, queries or problems to be solved, etc. 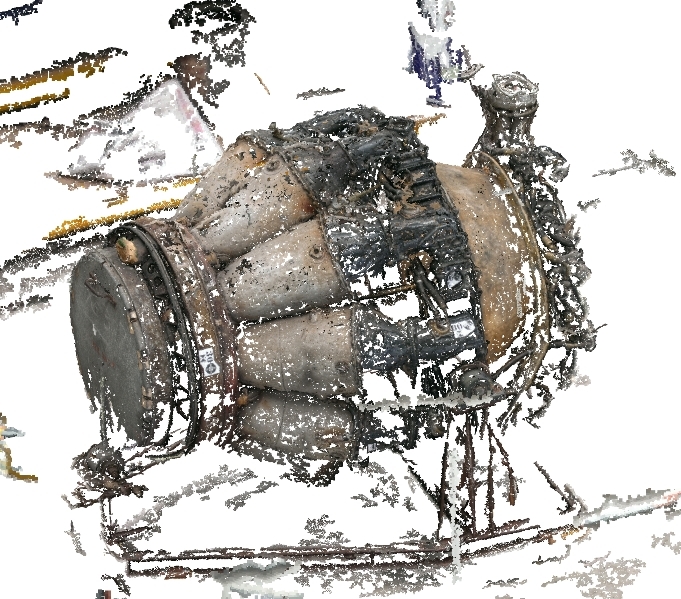 When correctly scaled the point cloud can be used as the basis of a Digital Mock-Up (DMU) in a CAD package. 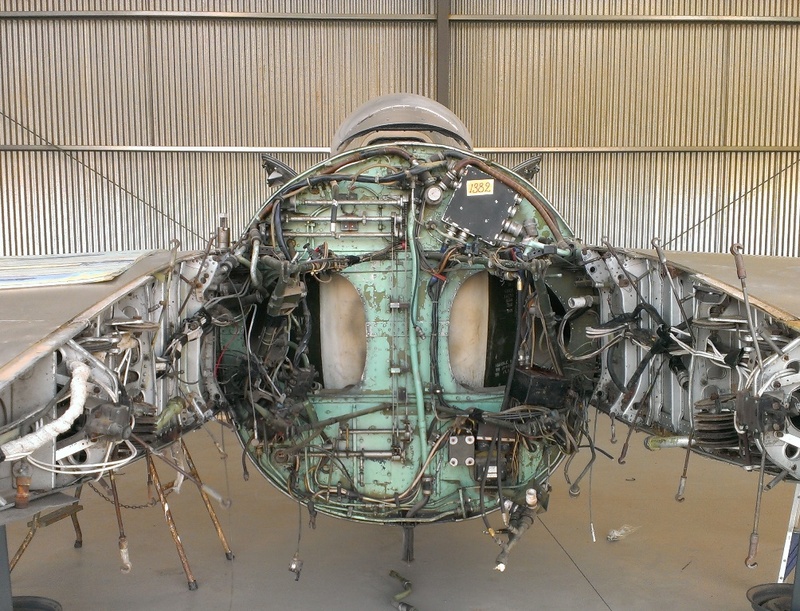 Any parts that need to be reverse-engineered can be located correctly and relationships to structure and other components can be assessed in general terms. This would need to be used with caution, but could be used for initial assessments before fabricating new-build parts and could indicate areas that require more detailed study before proceeding. In 2016 I was starting to build a detailed understanding of all of the Vampire’s wooden structure. The exact build up of the structure at the tight little area between the aft of the Duct cut-out and Bulkhead 4 (the firewall) was unclear to me. 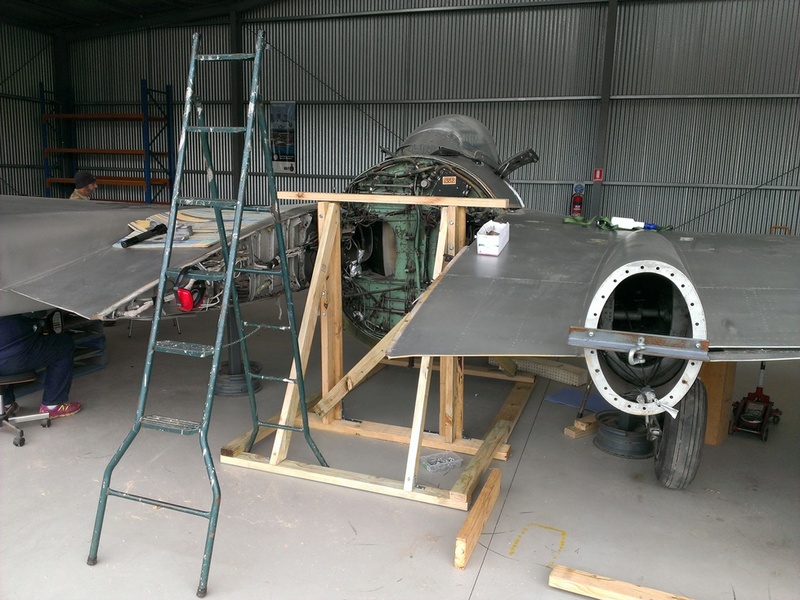 The build is compound with the various laminates being built up in different directions – circumferentially around the cut-out, circumferentially around the fuselage, and with differing cover plies according to how much room was available. This gave rise to an exercise in determining the amount of detail that can be captured with VSFM in a portable 3D expression – meaning that I wanted to be able to study the structure when I wasn’t in the shed with the Vampire. The result was excellent! 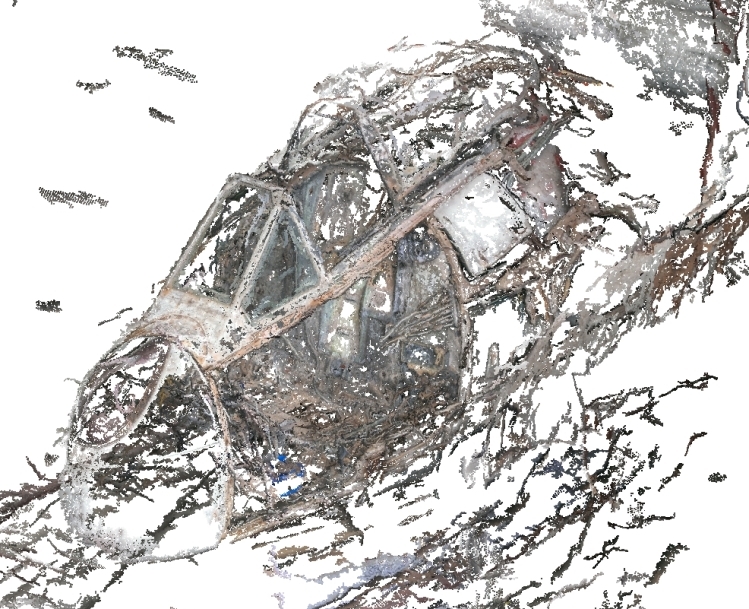 By this time I had become realistic about the computing power required to complete large photogrammetry tasks. I now had a workstation with an Nvidia K620 GPU. This made mole hills out of mountains! My first jobs for 2017 were an entire detail shoot of the fuselage of A79-733 and a detail shoot of A79-175’s RH instrument panel in-situ. The purpose of these shoots is a true test of the potential use of this data in CAD. 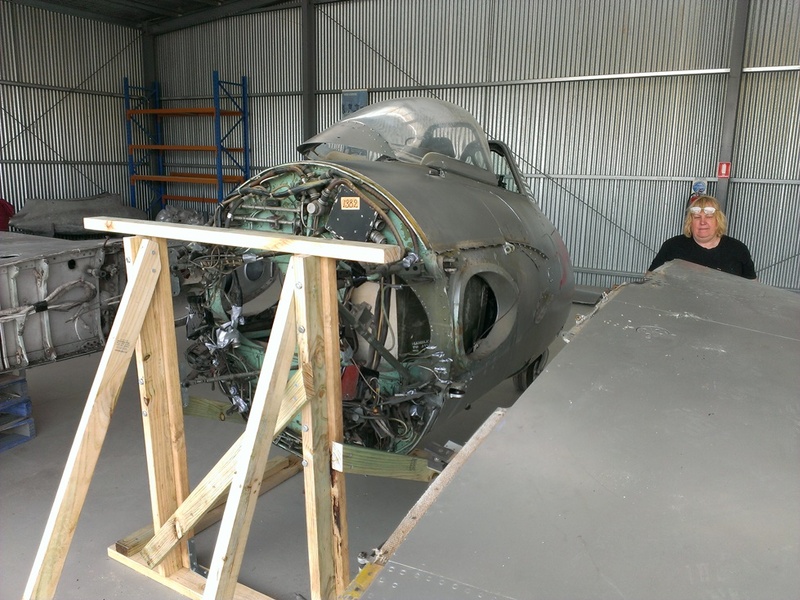 My next project was an initial pass through the interior of Camden Museum of Aviation’s GAF Lincoln Mk.30A cockpit/forward fuselage section. This is a large and complicated structure and I simply did not take enough photos to produce a point cloud that would get people excited! There were two issues with the result. Firstly, VSFM can run out of information to connect all photographs – simply, there are not enough photos to put everything together. 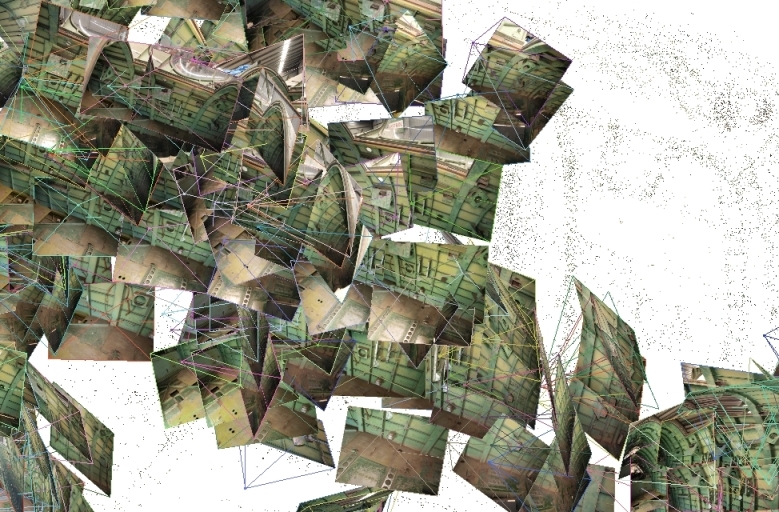 The result is multiple reduced recreations that represent local features of the full object. 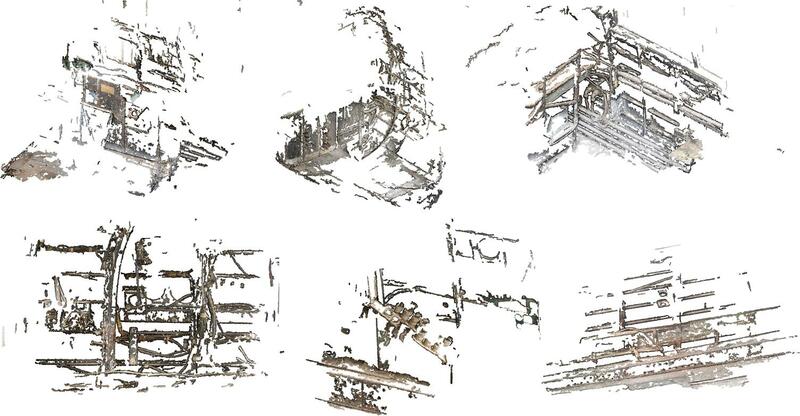 Each point cloud, whether a successful result of the entire object, or of a fractured, is called a model. The result for the Lincoln was nine models. 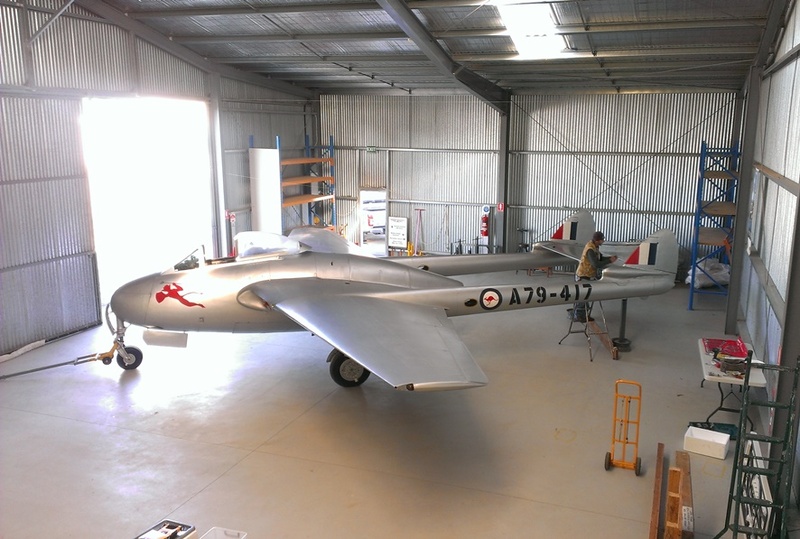 Visiting Albury in 2015, I took a series of 52 photos of the interior of DC-2 A30-11 – the aircraft painted as Uiver. This was a rushed effort but I felt the result showed potential. 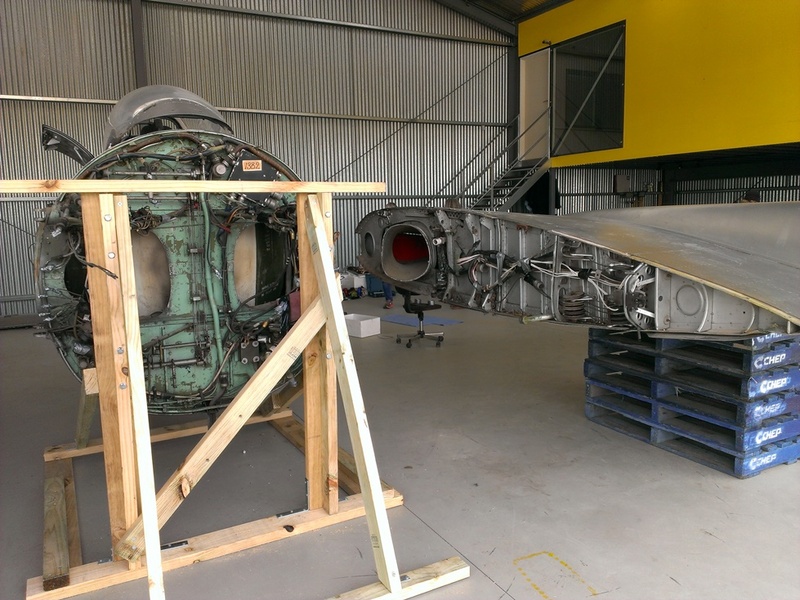 Since 2014 I have been researching and trialling photogrammetry as an aid in rebuilding the fuselage of Vampire A79-733. My efforts have only been sporadic due to my usual lack of focus and other priorities. My first photogrammetry used Autodesk 123D. I was also thinking about possibilities for 3D printing. Starting with something simple, I chose a TR-1936 controller because I wanted to make a mockup of a TR-1520 controller – the latter seems to be made of unobtanium. From a reverse-engineering point-of-view, this was not a particularly good idea; the boxes are very simple and the obvious method would be to get out the ruler and just measure up or even just cannibalise a 1936 unit. Starting with something simple was all that lay behind it. 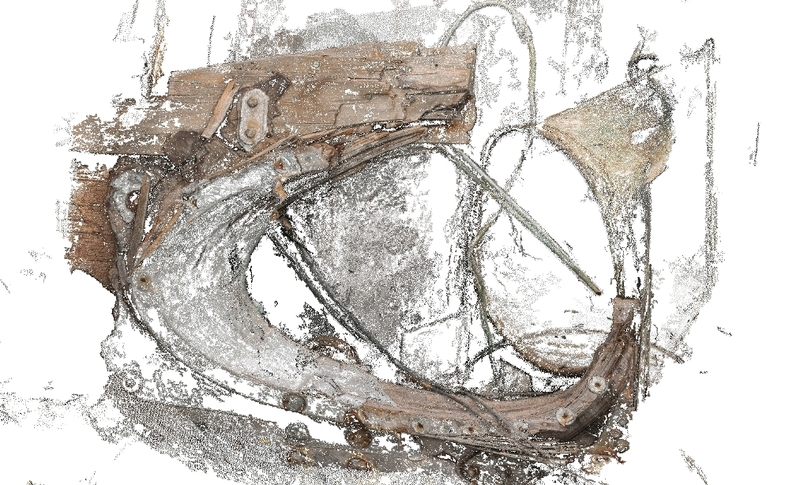 I had already done a fair bit of reading about photogrammetry so was aware of object characteristics that are unhelpful to the process. This simple test highlighted these issues. The controller I used was of very good condition and was very clean. The controller has plenty of reflective surfaces; the Perspex of the dial window, the nice fresh knob, the glossy lacquer over the ink mod markings and even the overall black paint. 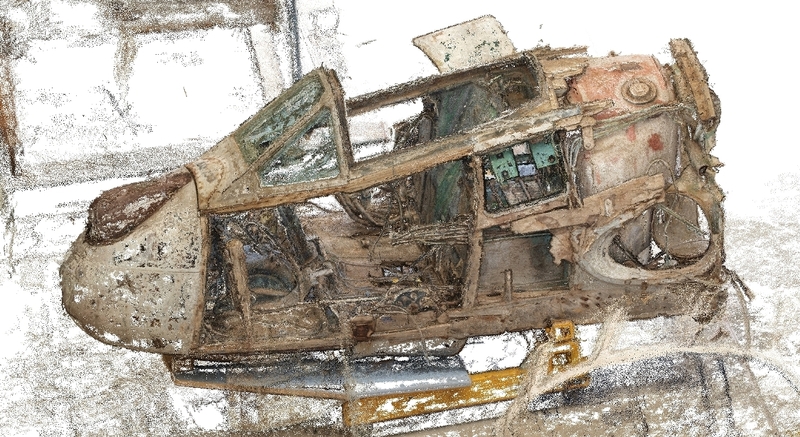 The basic photogrammetry process relies upon many unique features to triangulate upon. A uniform surface – the smooth black paint – is a ‘large’ expanse of nothing to triangulate. A glossy surface reflects and may just transfer ambient diffuse light to the camera lens or a reflection of something beyond in the area that surrounds the object. The Perspex of the channel dial may send light or a reflection of something beyond to the camera, or the camera may see the characters of the dial itself, or in one photograph, we might see a combination of both. Seeing different things from different angles ‘does not compute’. Depending on the software, it may present the initial result with holes or it may have some means of creating infill. The TR-1936 controller with 123D was a disaster! 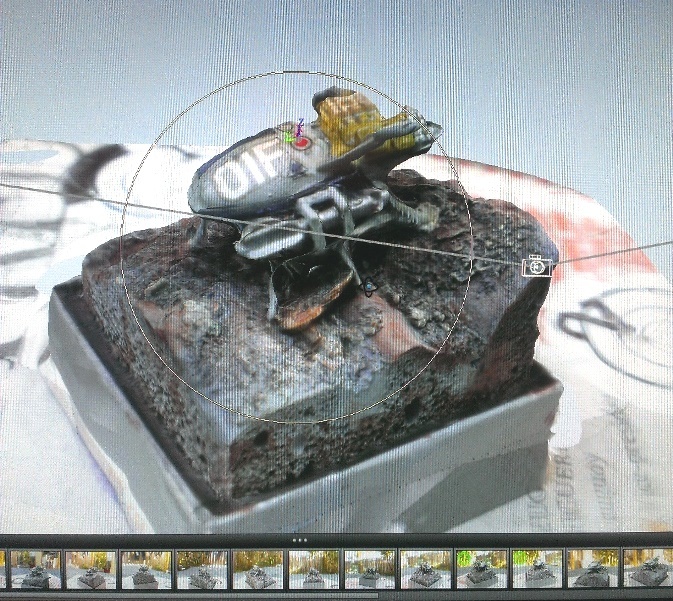 Knowing the limitations, I then created a 123D project using a ‘Bug’ by artist Mark Brown. This was initially very successful, but then I made one mistake. Fatal. And in 123D there is no undo. I lost most of the job which had been very tedious. While I wanted to take the project to completion, working on the cloud started to be a problem and I gave up out of frustration. 123D is targeted at 3D printing and has a strong infill capability. I quickly decided that 123D was not for my main project and went elsewhere. I had previously looked at VSFM by Changchang Wu, that has CMVS by Yasutaka Furukawa built in through the user interface, without making any real progress. This time I ran photo series of Mark Brown Bugs. The results were ordinary only, but I could see that this was because of the quality and quantity of photographs I used, and because of the plain white-wall background to the photos. Sometimes I become impatient. This was one of those times. I decided to leap in the deep end. 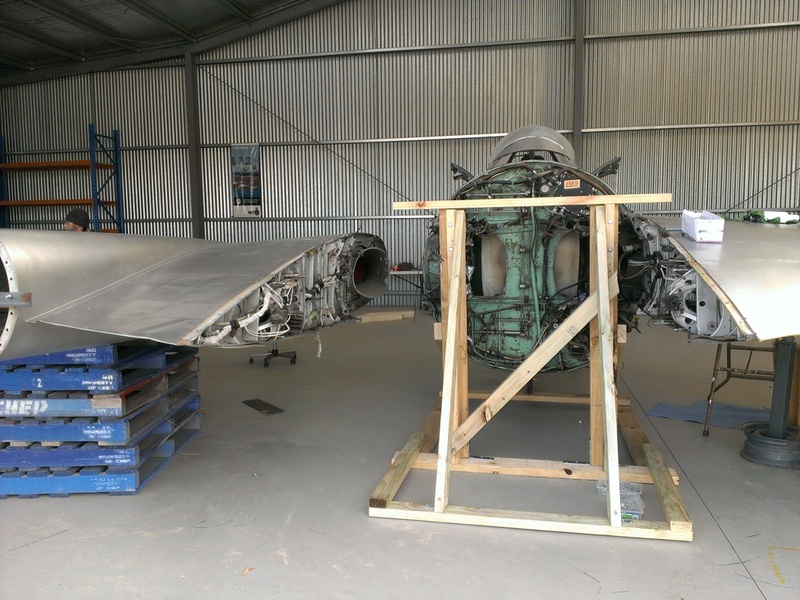 I took 100 photographs of the fuselage of Vampire A79-733. Without too much fuss – just some memory problems and 17+ hours of my business-type laptop grinding away – I got a an impressive outcome. See below. 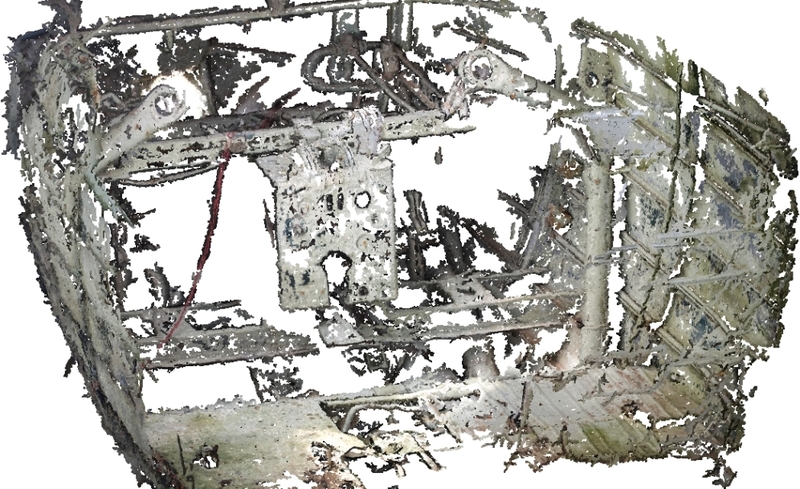 After that success, I created a point cloud of a Rolls-Royce Nene Mk.103 from 170 photos. My Laptop struggled a great deal from this load; VSFM stopping several times as it ran out of memory. This was not such a big deal as VSFM stores its work as it goes, so on starting a run again, it resumes processing from where it crashed. I saw these runs as a way to learn to use the software and to see what it could do; to see what I needed to do to make it useful.